So my Socket 478 Prescott build is pretty much done and is a tad bit overpowered for the games I mainly play so thought I might as well put together a P3 Tualatin box which I've always wanted to do. Never owned a Tualatin so having one now while I have some disposable incomes not a bad idea. Plan is to mix older parts with some newer gear to create a reliable, fast, slightly confused and aestheticly pleasing build. Not to some folks taste however but I'll try my best to keep it retro orientated. With majority of PCBs to be green + some green lighting and will sit alone side my daily/office PC in my home and won't look too out of place like a few of my beige builds which are now in the shed thanks to the wifey..
Sleeved cables kit - Not sure on colours yet..
Last edited by D3FEKT on 2018-8-01 @ 07:21, edited 3 times in total. Last edited by D3FEKT on 2019-1-09 @ 01:30, edited 5 times in total. If you want to get the most out of your Tualatin, I recommend you to try a slimmed down version of Windows XP that later you can tweak to reduce as much RAM usage as possible. 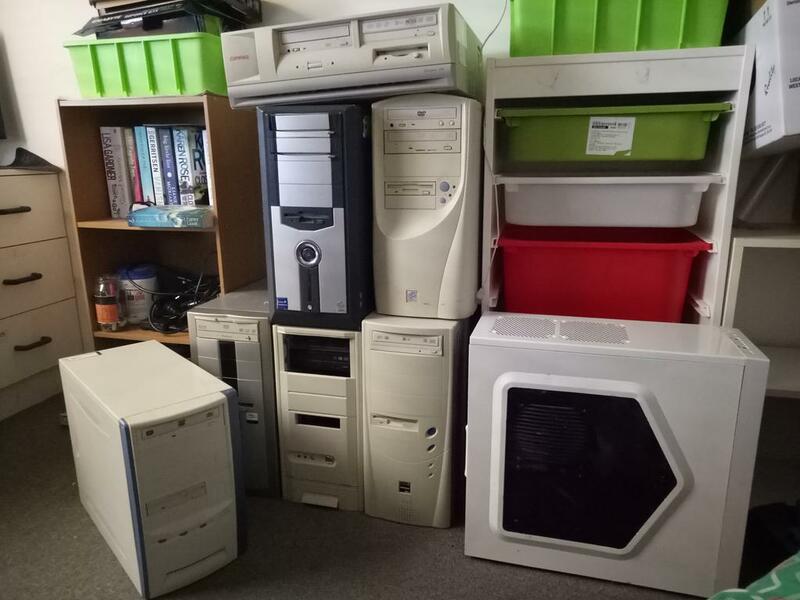 I use a Pentium 3 Tualatin as my main computer and it's quite fast and usable despite the age. If you can overclock your Tualatin you'll get even better performance. Mine for example works at 1.47GHz stable with the RAM running at CAS2 Turbo. And consider that unlike you, I run two WD Velociraptors and the main one is hooked to an ATA133 card with a SATA to IDE converter, because if I had an SSD it would be even faster! Graphics card wise, at least from personal experience, I recommend you a Geforce 6800GT or a 6800 Ultra, if you can find one. I run a 6800GT at slightly faster-than-Ultra clocks and it's perfectly stable. They run wonderfully on a Tualatin. An ATI Radeon HD3850 or an X1950 Pro can be alternatives too but in some cases they slow down the performance of some games, most likely due to the CPU bottleneck. 1.4GHz Tualatins are awesome CPUs, you'll be amazed to see what it can do, not only for games. Thanks right now I have a 6800 XT and an X800 all in wonder card which are my two most powerful AGP cards however they're both red PCBs which destroy my colour combo I'm going for. 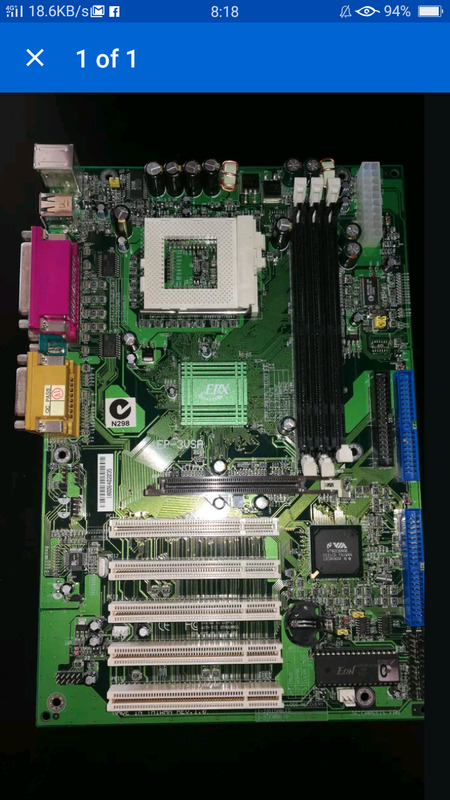 I have a Leadtek 256MB FX5200 and an OEM 256MB 9550 both in green so I'll slot one of them in for now till I can find a 6600 or 6800 in green. 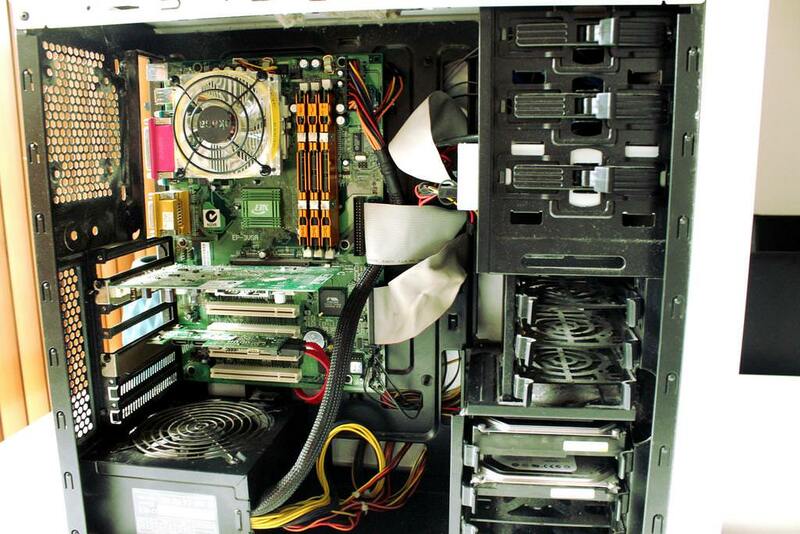 As for the processor, currently Its just a 1Ghz Coppermine till the Tualatin arrive. I do have a Tualaron 1300Mhz I can slot in for now and do some benchmarks between the graphics cards and the different CPUs..
looking4awayout is a very patient person. Got some mail today, two Tualatins and Sata card arrived. Still waiting on a few bits and pieces of ebay but atleast i could throw it together for now. 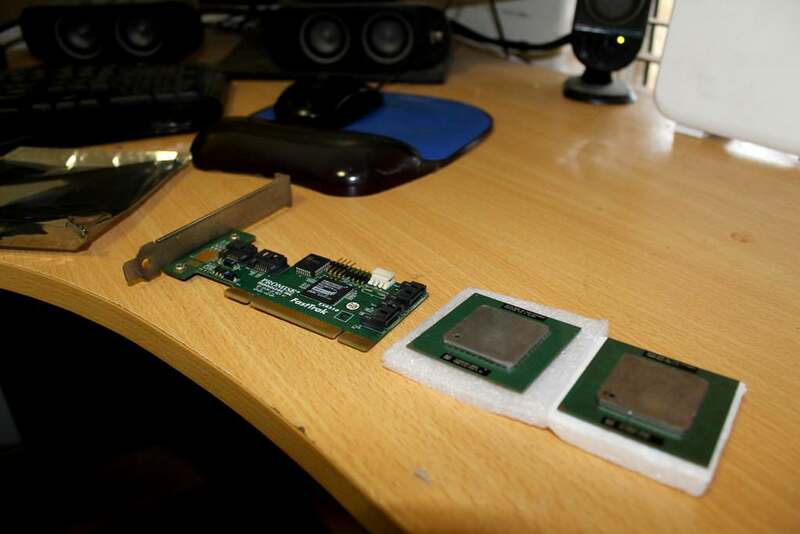 Received the SL5ZJ Celeron 1.3GHz and the SL6BY Pentium III-S 1.4GHz + Promise TX4310 PCI SATA card. I've put it all inside some cheap DeepCool case with 460watt Coolermaster PSU, i had these laying around from my sons old PC. 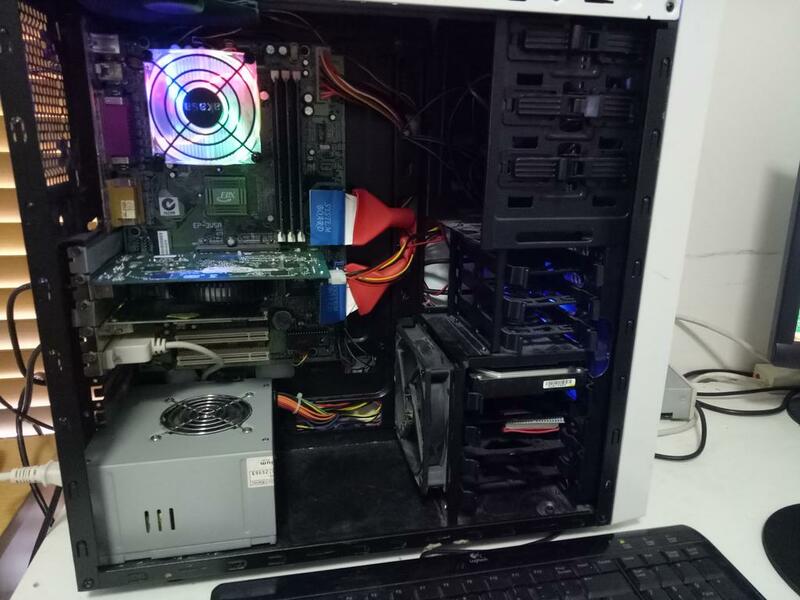 This is only temporary for now, I plan on replacing the case and psu with something a bit nicer and modular, fill it with green led fans and give a bit of a cable management. Might even look at a cheap AIO liquid cooler just for the hell of it. but all green looks as amazing as I thought it would. Haven't toyed around with this for a bit, been busy with a few other builds i'm doing for some friends. I've downgraded and also upgraded a few aspects in this build but have it running very nicely for now. The only problem i have with it is it's too fast for some games yet too slow for others that I play so can't really find a use for it. I have overclocked it from 1.4GHz to 1.7GHz @ 162FSB, Temps sitting at around the 40degree celcius mark and still using standard core voltage. ram is limiting me from hitting any higher, so on the hunt for something better and will try go higher. D3FEKT wrote: The only problem i have with it is it's too fast for some games yet too slow for others that I play so can't really find a use for it. Just thought I'd chime in here with some of my own experience. If you're still looking at doing an AIO for it, I've got some advice. I've been playing with "AIO" style setups on retro PCs lately, on everything from Socket 3 up to 478, including Slot 1 (not 2 yet). 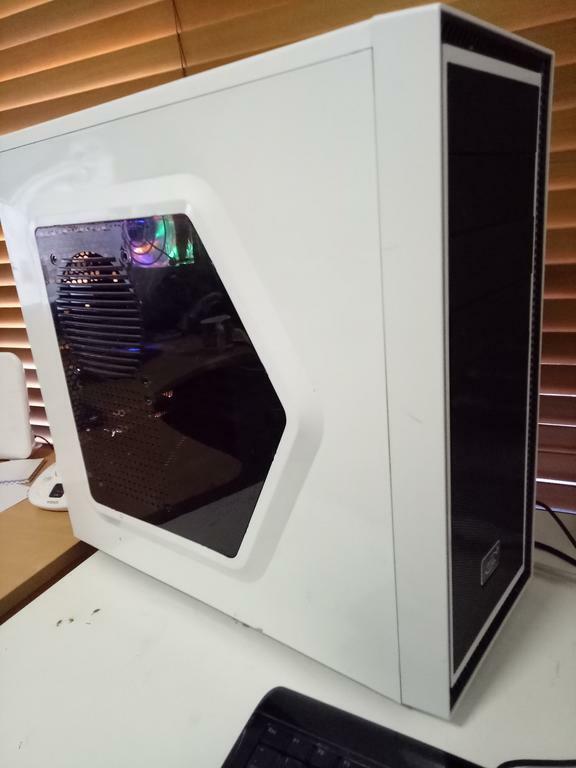 It can actually be done incredibly cheap when compared to the cost of a new branded AIO such as Corsair. The catch is that it requires some minor watercooling knowledge (or research), a willingness to sacrifice an old cooler or some fabrication enthusiasm. Used server AIO standalone pump/cold plate units can be sourced for under $10 AUD, mainly from CoolIT/Asetek. 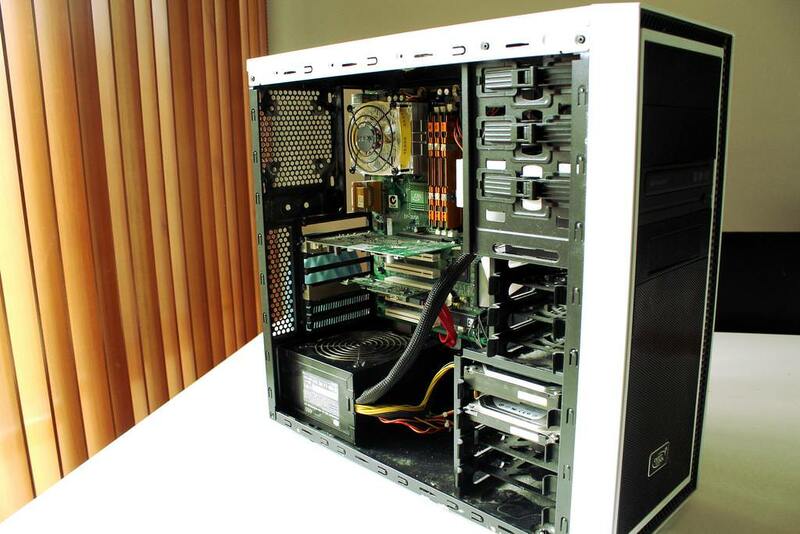 They're great since they are compact and meant for 1-2U chassis. Since they are standalone, they are also perfect for this sort of use case. All you'd need is a radiator size of your choosing, a coolant mix, some tubing and a few fittings. The difficult part is filling the unit, but it's not an insurmountable challenge if you spend a few extra dollars on additional fittings. I've had good success with EPDM tubing & Mayhems XT-1 Nuke. Of course if you want coloured/UV reactive coolant, you can use some clear tubing too. Putting the loop together is fairly basic, and only requires one 3 pin fan header for power, though it'd best be served when plugged in with a molex adapter. Mounting can be done in two ways. 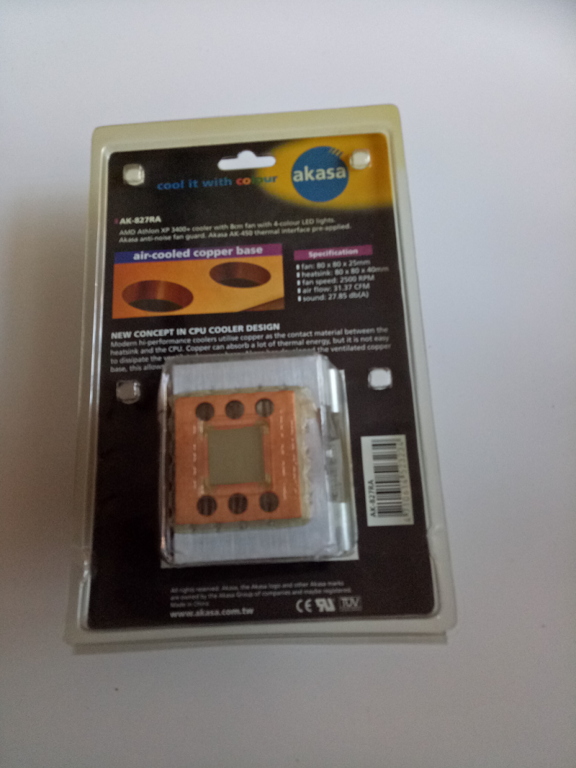 The first is similar to what I did with my Pentium III and its cold plate, which is simply using a normal CPU cooler mounting clip and adjusting it to fit for the heightened block. It works well, and mine has been held in place for over a year without issues. The second way is fabricating a bracket. This is what I've been thinking about the most. Using 0.3 - 0.5mm stainless steel sheets works great. You can cut it with hand shears and file it down. As a lot of these AIO units have mounting points built in, it's easy to cut one out to fit its intended shape. All in all, total cost is around $50 AUD if you need to buy tools and want to fab. Less if you have tools already. - Radiator size of your choosing. 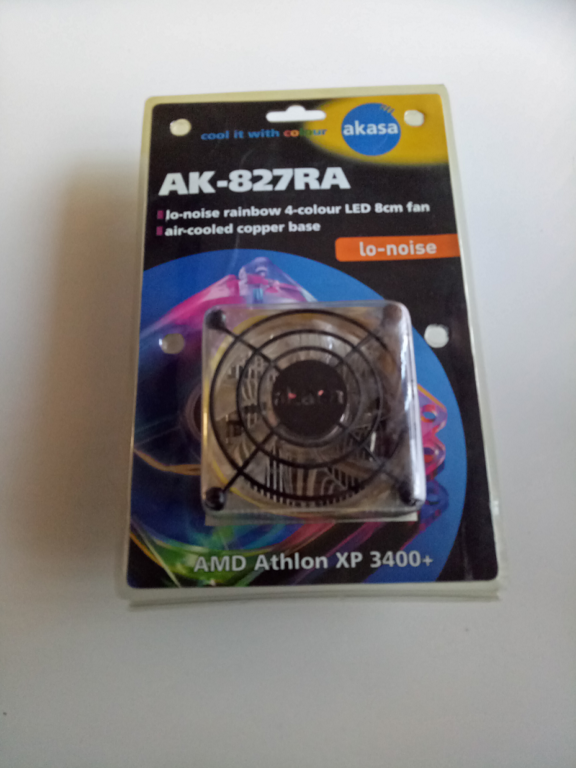 You can of course pick a 120mm or 140mm fan for a modern case, but it allows you to mount inside old cases too with 80, 72, 60 or even 40mm radiators. - Tubing can be cut to length. Great if you need to put it in an odd position. You also get the benefit of knowing you made something cool (no pun intended).